It’s been three weeks since we moved into our new place and aside from the pile of my husbands clothes in the corner (we are on the hunt for a new dresser) you wouldn’t know it. Just two days after moving in, we had already unpacked all of our boxes and felt pretty settled. We still have decorating to do, but that will be something that happens over time and don’t worry, I will absolutely be sharing along the way. Before we get there though, I wanted to share with you the steps that we took to have the least stressful move that we possibly could, especially with two toddlers. Our move was sponsored but Roadway Moving. All opinions and tips for a stress free move are my own. before you even begin to pack, room by room, declutter like crazy! We started decluttering the minute we knew it was official that we were going to be moving–Marie Kondo style, prior to even watching “Tiding Up” on Netflix. We decluttered like crazy, prior to packing and it made such a difference. I am pretty sure I donated well over 50% of our belongings. If you do this ahead of time, you can even plan to sale items that are still in great condition. I managed to make over $2000 in one week, selling items in Facebook market and on Instagram. Breaking a move down into easy to complete task, will help to reduce overwhelm. With your plan you want to assign one task each day, that way the move/packing won’t seam overwhelming. Don’t forget to order boxes prior, so that each day you can have a specific category you plan to pack and complete as you go. I started this step, by first listing out all the categories that would need to be packed and any other steps that would make the move seamless (ex: book movers, set up wifi/cable etc.). I then was able to prioritize the list and assign each task to a specific day. With kids, always prep AHEAD! During the packing stage, we saved the toys for last. One week prior to our move, we packed up all the boys toys except for one small box that was packed the night before. For the day of the move, we made sure to have both iPads and two toys each, to keep the boys occupied. We also laid our the boys clothes the night before so we could pack the rest and our course snacks and diapers for the littlest toddler. Funny enough, as we really needed was one empty box, which kept the boys occupied for a majority of the time, while the guys from Roadway Moving were doing all the heavy lifting. 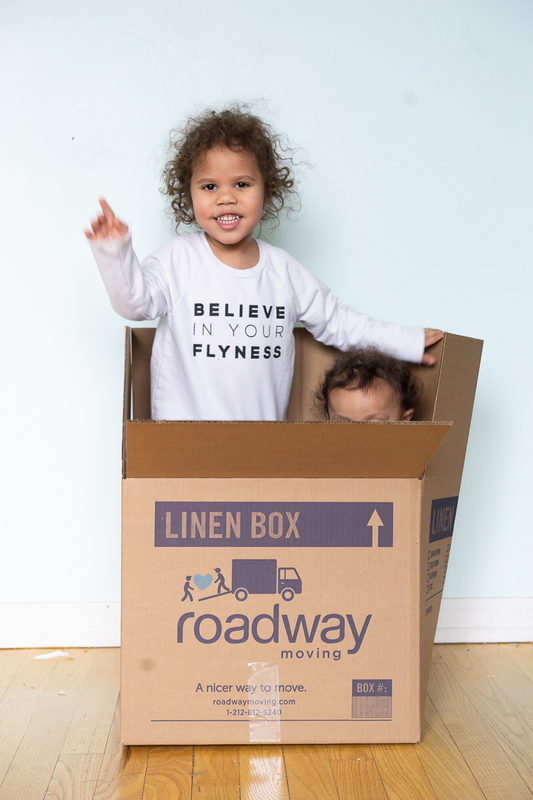 Roadway Moving was a game changer for us. Did you know the average person moves 19 times in their life?! I’m only on my 8th (my mom is still holding it down in the house I grew up in), but this was my second time using professional movers. I personally prefer to do the actual packing myself, so that I can ensure everything is organized as I would like, making for a seamless unpacking. But, having a professional team, like Roadway Moving, to wrap furniture, lamps, mirrors and everyday kitchen items and then actually do all the heavy lifting, it pretty much a necessity IMO, especially when kids are involved. Trust me when I say, you’re going to need your hands free. Not to mention the movers (at least Roadway Moving) will dissasemble and reassemble all furniture, can I get an AMEN! Don’t wait until the movers are gone. The biggest advantage to all the decluttering and intentional packing we did was that once we arrived to our new home not only was it easy for the movers to know where to put #allthethings, but it was also extremely easy for me to start unpacking as they loaded and unloaded boxes into our new place. I had at least 50% of all boxes unpacked before the movers even left and finished the rest over the next couple of days. And when I say unpacked, I mean, unpacked and put away! During this time, Joe took the boys down to our the playroom in our new building, which made the whole process a lot easier. I couldn’t have asked for a better moving day. Not going to lie, I was a bit nervous on how it would go with the boys, since we don’t have a babysitter and they were with us the entire time, but I clearly had nothing to worry about. Roadway Moving took care of everything and they were super efficient too! 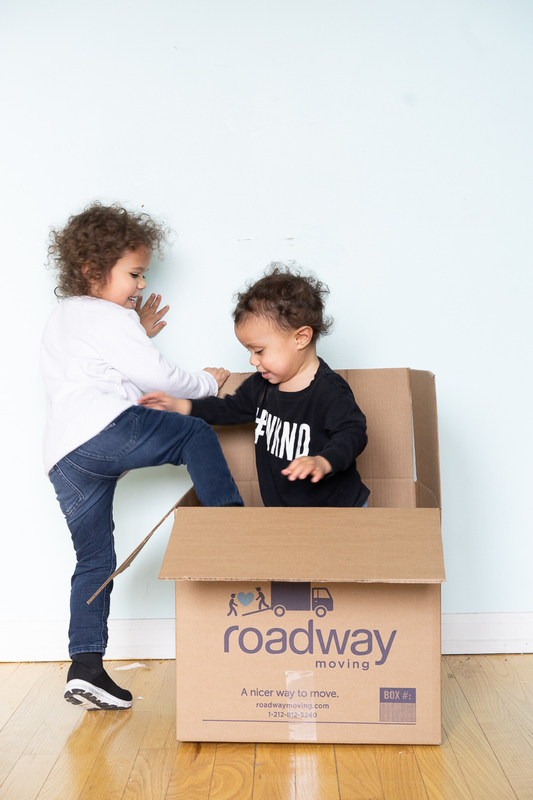 If you’re planning a local move anytime soon, please try them out! I promise you they are they wont disappoint. This post is brought to you by Roadway Moving. Thank you so much for supporting the brands that I love!